In a world of digital communications, does traditional media really matter? Yes, it matters. Perhaps more than ever. Now that everyone can self-publish – with our personal blogs, Facebook pages, Twitter handles, LinkedIn profiles and much more – suddenly everyone’s a reporter. However, certain mediums and truly influential traditional reporters will always carry more credible weight than others. While your brother-in-law may run a popular blog, news outlets and publications like the New York Times, Rolling Stone, and the Washington Post are still very much relevant and respected. With the flood of information coming from every avenue, readers are seeking credible sources. News media is critical to disseminate relevant stories to the public and to contribute dialogue and understanding. Paired with shrinking newsrooms, it is up to communications professionals to serve as useful resources for getting important news stories covered. We provide the information, background, data, and experts for the stories that deserve coverage. But how does one go about getting a top-tier placement? What are my organizational goals? Whom do I want this news coverage to reach? What do I want my target audiences to know or do? What does success look like? What’s my dream coverage? 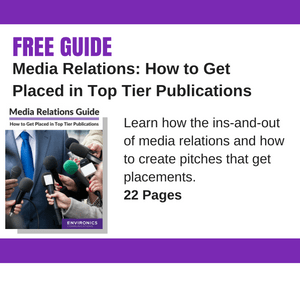 Answering these media relations strategy questions are critical to your success. Yes, everyone wants to be on The Today Show, but is that really strategic? Will you be meeting the goals of your organization? Is your audience really tuning in at 7AM ET to watch TV? A lot of times people get hung up on doing things because they sound good. It sounds good to have been on The Today Show, but what results did you garner from the time and resources spent to get there? Traditional media matters for informing and influencing a wide variety of audiences, from big to niche. Just one well-placed story can have a huge impact for reaching communications goals. And based on answering the above questions, you’re ready to create a media relations strategy.